Most of us enjoy dining out from time to time. Whether through online booking services or high-earning credit cards, there are numerous opportunities for earning points when you dine. It’s even possible to earn points multiple times through the one booking! Below are my tips on how you can maximise your frequent flyer points haul when you next visit a restaurant. Both Qantas and Virgin Australia Velocity are affiliated with online restaurant booking platforms, allowing you to start earning points when you reserve a table in advance to dine out. Not all venues are covered, so you won’t always be able to use one of these services. Both platforms offer good coverage in all Australian capital cities, ensuring you’ll find something that works for you occasionally. You’ll earn an easy 100 points per diner (200 points if your status is Platinum One) by booking one of over 3,000 restaurants via the Qantas Restaurants portal powered by Dimmi, and linking your Qantas Frequent Flyer number. Over 4,000 restaurants are on offer across Australia. With points awarded on a ‘per head’ basis, Qantas Restaurants is great for booking work lunches and large gatherings. In my experience, points take around 6 to 8 weeks to post. Unfortunately, Qantas has recently announced that Qantas Restaurants will cease to operate from 1 January, so get in quick if you’d like to earn some points when you book your meal. 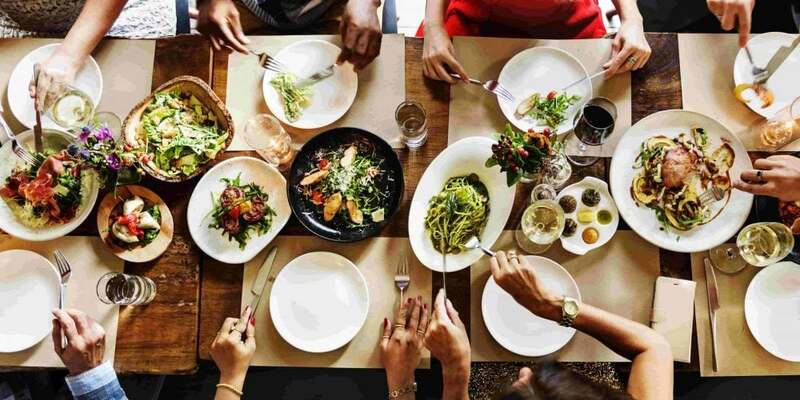 Velocity has teamed up with global restaurant booking service OpenTable to offer points for restaurants across Australia. You can search and book hundreds of restaurants across Australia here. Users are credited with 300 Velocity Points for every honoured booking – regardless of the number of people attending. This makes it a good option for solo diners. The choice of restaurants is varied and arguably offers a greater choice of higher-end venues than Qantas Restaurants. Top end dining destinations like Dinner by Heston Blumenthal and Vue De Monde are on offer. Tip: Neither of these restaurant booking platforms requires a minimum spend when dining. Technically you could use them to book in your breakfast or morning coffee fix before work – though not advisable. Cathay Pacific’s loyalty scheme, Asia Miles, offers points for dining over 300 partner restaurants in Asia. Locations include Hong Kong, China and Singapore. You need to be enrolled in Asia Miles, and you simply provide your membership card when paying the bill to earn points. You can search for restaurants that participate in the scheme here. American Airlines AAdvantage Dining scheme allows you to book at over 11,000 restaurants in the USA. You’ll earn a generous 1,500 bonus points when you spend $25 or more on your first participating restaurant visit. A further 500 points are on offer for each of your three subsequent visits within 30 days. Tip: If you’re staying at a hotel which has a restaurant offered on an online booking platform, consider making a booking for your breakfast or another meal, even if it’s free or included in the room rate – you’ll still earn points. If you’re feeling peckish but don’t want to head out, order in with food delivery service Deliveroo. Qantas Frequent Flyer members who have linked their Frequent Flyer number to their Deliveroo account earn 1 Qantas Point per AU$1 spent on orders through the Deliveroo website or Deliveroo App. Qantas Points will be credited to a member’s Qantas Frequent Flyer account up to 60 days after purchase. With your online booking in place, and your payment method sorted, look at stacking with a dining discount. Many venues that are bookable via the Qantas Restaurants or Velocity Dining platform are also featured in the Entertainment Book, which offers either 25% off your bill, or a 1 for 1 main course offer. There’s no need to pre-book with your Entertainment Book – so you can use it in conjunction with an online restaurant booking platform. You can find out more about purchasing the Entertainment Book here. Alternatively, take a look at Dimmi’s current Flash Sale promotion, which provides diners with access to a 50% discount on your food bill at many restaurants across Australian capital cities. Unlike the Entertainment Book, Dimmi Flash Sale offers are free to access. Unfortunately, they aren’t stackable with a booking via Qantas Restaurants or Velocity Dining. You’ll need to book directly with Dimmi. Once your dining experience has concluded (and you’ve convinced your friends, family or work colleagues that you get to pay for the meal on your card!) it’s time to ensure that your spend earns you maximum points. My go-to card for restaurant spend is the top-earning American Express Platinum Card. It offers 3 points per $1 spent at eateries (points transfer 1:1 to Qantas, Virgin, Singapore Airlines and other airlines). Other high earning cards in the AMEX stable include the Explorer Card (2 points per $1) and the Qantas Ultimate Card (1.5 points per $1). AMEX has also recently entered a long term partnership with Dimmi, enabling card members to easily identify American Express accepting Dimmi restaurants – this is handy when strategically chasing maximum points! Alternatively, for a different take on dining rewards, take a look at the Citibank Dining Program, which provides Citi cardholders with a free bottle of wine every time they dine at selected restaurants and pay with their Citi card. Whether through online booking services, dining offers and high-earning credit cards, there are numerous opportunities for earning points and saving money through dining. Next time you dine out, or order in, consider how you can maximise value from the experience.